One time I met a tall slender man with thick white hair in Barnes & Noble. He talked to me for almost ten minutes about his twelve-year old granddaughter’s bright blue eyes, her fear of the dark, her obsession with Teenage Ninja Mutant Turtles. And then he looked straight at me and asked if I thought she would ever get married. Whether they go by Grandma and Grandpa or Nana and Pop or Meme and Bumpa, they all ask about sensory integration and weighted blankets and self stimulation: the buzzwords that weren’t around when they had small children. They are hungry for knowledge and yearn to connect with their sometimes spinning, oftentimes silent grandsons and granddaughters. I never feel like I have enough time to answer these questions the way I would like, so I stammer and stumble through something meaningless and disjointed. Then I pack up the extra books and my black pen and walk to my car feeling unfinished, incomplete. Back when we were in the process of Jack’s diagnosis, we lived in Buffalo and Joe’s parents lived in Lake Carmel—a six hour drive away. Over the phone every week I would describe his lack of speech, his delay in development, the eerie way he wouldn’t look at me. And they always said the same thing: give it time, his older brother Joey is talking for him, he is fine he is fine he will be fine. Jack was nearly three when we moved to New Hampshire, and my in-laws followed from Lake Carmel about a year later. By that point it was well understood that Jack was not fine. Before long they started taking some of the other kids to sleep at their house, to teach them meatball-making and sing them to sleep in the small guest room. But not Jack. One time they drove down the driveway with Joey and Charlie waving from the backseat of their Saturn while he stood next to me, turning the same Little People figure over and over in his hand. I couldn’t help but feel as though some invisible line had been drawn; them, but not him. They would never understand him, never be able to handle him. And who could blame them? At that time Jack was a total flight risk, adept at picking locks and slipping silently out the door. He only knew about a dozen words. He threw giant tantrums and woke several times a night. The truth is, they were as heartbroken as we were. They longed to connect with their enigmatic grandson, to play checkers and make meatballs and teach woodworking. To make communication matters even more interesting, Joe’s parents have the unusual habit of referring to themselves in a directive or comment. For example, say Joe’s father is asking Jack to close the door. He’ll tell him, “Hey, close the door, okay Grandpa?” (Again: I do not even have autism and this confuses me.) For years, Jack just looked at them blankly and walked away. I can’t say there was a turning point exactly—a lightbulb moment when Grandma and Grandpa at last understood the intricacies of the spectrum disorder and became autism whisperers—but I can say they never gave up in their pursuit to understand this sandy-haired boy. I remember one time they spent the afternoon at our house. It was late fall and chilly out, and we were all outside on the play set, brown leaves crunching underfoot. Except for Jack. He would not leave the house, but stayed just inside the kitchen, watching everyone through the window like an interloper on the wrong side of the glass. Every ten minutes or so, either Grandma or Grandpa would walk inside to try and coax him outside, to swing high on the swings and slide fast down the slide. I bet they tried at least a dozen times, until at last Jack emerged—wearing neither shoes nor a jacket. Finally, when he was about six, it was Jack’s turn to spend the night in their cozy one-story ranch, his turn to gently drift off as his grandmother sang Italian lullabies in the darkened bedroom. And once he was asleep, Joe’s mother and father kept a silent vigil over him all night long—watching and waiting in case he woke up and slipped out the door, even though his days of wandering were behind him. Now Jack is nine. Sometimes we go to Joe’s parents for Sunday dinner, and he will march up to Joe’s mother in the middle of the meal with a yellow pear in his hand and wordlessly thrust it at her. Joe and I object and protest; Jack Grandma isn’t done eating yet let her finish. But every time, she shushes us and bends closer to him, whispering for him to hand her the ripe fruit. She picks up her knife and peels it, handing him section after section while he hovers at her elbow. Over the years they have figured one another out. Jack learned to close the door, Grandpa and Grandma understands that Jack will wear a jacket when he’s cold. He stays there regularly. If I stopped right here, if I told the grandfather at Barnes and Noble this collection of stories, my message would have been obvious and cliché: when your grandchild has autism you need accept what you can’t change and love them for who they are and never give up and blah blah blah. But it still would have been meaningless and unfinished. Because I have another memory that keeps popping up in my subconscious, a memory that somehow seems important, integral. We were at my sister-in-law’s house just outside of Boston for a birthday party. Jack was about three, and over the course of the afternoon he and two-year old Charlie were at each other again and again, fighting and kicking. I don’t even remember why, but I think it had something to do with a deflating balloon. I vaguely recall them grabbing and snatching and shrieking for it as the white circle drifted around the crowded kitchen. I do remember I was hot and I do remember I was irritated. I remember I was tired of hearing my two boys screech and scratch at each other, tired of separating them again and again. Finally, Joe put Jack in a timeout in the living room and instructed him to stay there. Both Joe and I were outraged. Outraged that she interfered, outraged with one another, outraged with a son we could not figure out. On the hour-long car ride back to New Hampshire we niggled and argued, bickering about timeouts and in-laws and how to handle children who threw tantrums. But sitting at my desk now, six years later, I finally understand what my mother-in-law had figured out during that party. She didn’t know the terminology for sensory integration or regulation or self-stimulation, but she recognized a small boy who was overwhelmed and tired and sad. She didn’t need sophisticated language to diagnose two parents who were on the verge of a breakdown. Yes, there are unfamiliar terms like joint attention and IEP and theory of mind, but at the end of the day, it’s just you and this child. Do not be afraid. Deep down you already know these phrases; you know when a child has had enough. When your grandchild has autism, sometimes you’ll need to forgo the jacket. Yes, you’ll need to accept what you can’t change and love them for who they are, but when your grandchild has autism, never forget that you have your own message to share and lessons to teach. Sing the lullabies and make the meatballs. Autism has a lot of heartbreak, but many rewards. These gifts can be hard to see and easy to miss; some days it’s just a quick hug goodbye, a mouthful of ziti at dinner, a smile across the table. Some days, it may look like nothing more than a small boy standing next to you with his palm outstretched, waiting for his slice of a juicy yellow pear. This is gorgeous. Thank you so much for these words. I’ve shared via my own social media outreach and would love to interview you for my blog. Let me know if you’d ever be interested. http://www.dawnprochovnic.com . Now that I am the grandmother (Mem) of a typical (whatever that means….in my opinion, each child is like no other) 2 year old granddaughter, i truly understand that being a grandparent is so very special. I have learned how absolutely wonderful it is to see this beautiful soul grow and learn, and experience joy as only a child can. I don’t have the responsibility of possibly messing her up, which was always on my mind when I was raising her momma and aunties. 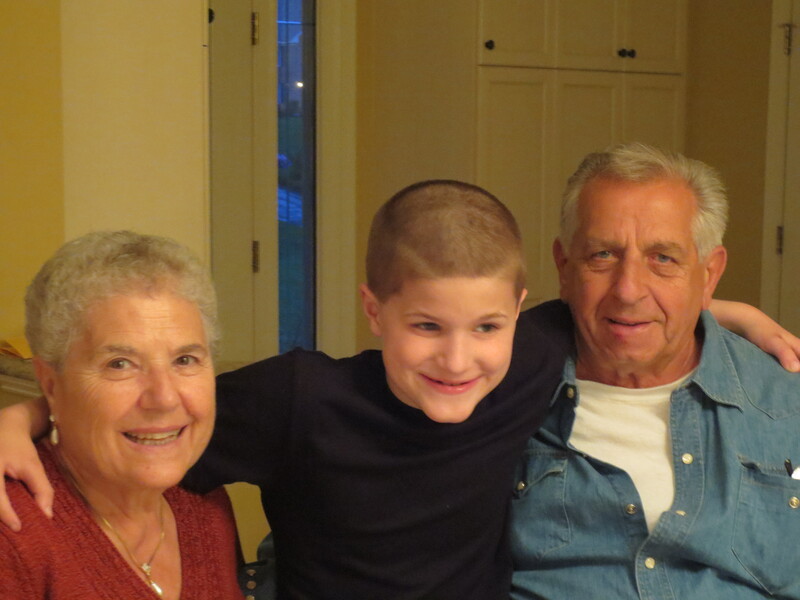 Grandparents have the most wonderful position….whatever diagnosis their beautiful grandchild has. We simply get to watch in amazement, share every new achievement however large or small, knowing exactly how much they struggled, and love. Just love them for them. 2 years ago Jack asked me how old my grandmother was when she died. She was 88. I was 32. It was too soon but now I know the exact place in my heart that she filled. I have a small child keeping that place warm. Maybe that’s all that grandparents need to start with. Love. As a grandmother I understand unconditional love, a hug means so much! Beautiful article. My mother has passed away but I know she would have been wonderful with my autistic son. I feel he really misses out not having her in his life. Cherish involved grandparents because you are very lucky to have them. Yes. I love your words here, friend. They are kind to the memories and true for the future.